The tallest known tree on earth is located in Redwood National Park in northern California. More than twelve hundred years old, it is approximately 380 feet tall--and still climbing! Carrie Pearson is a former early elementary teacher and the author of A Warm Winter Tail and A Cool Summer Tail. She hikes, bikes, runs, skis, windsurfs, kayaks, and swims--and writes about what she experiences. Carrie lives in Marquette, Michigan, with her husband and their three daughters. 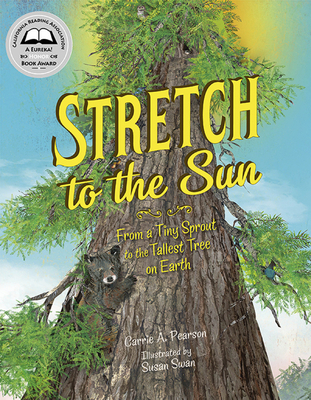 Readers follow the progress of a tiny sprout as it grows to be one of the tallest redwood trees ever discovered. Lyrical and gentle text, with a bit of understated repetition, sets the scene; this work begs to be read aloud. Swan’s collage-style artwork is appropriately dominated by a gorgeous spectrum of greens and browns. Many small animals and other details are hiding in the illustrations for children to discover. The story is experienced almost entirely from the tree’s perspective, and the tree is not concerned with human names or dates (the more fact-centric text is reserved for the “Facts About Coast Redwoods” back matter, a helpful guide for young kids and adults alike). In the only narrative leap away from the tree, “the president of the United States…signs a law protecting ­ancient trees.” In the back matter, ­sentences from the main story are revisited and ­explained. Here kids learn about the Gold Rush, the Save the Redwoods League, frenzied logging activity, the creation of Redwood National Park, and its expansion signed by President Jimmy Carter in 1978. ­VERDICT Visually appealing and ­enjoyable to read aloud, this book is a ­versatile introduction to redwood trees and forest conservation.